Good morning and thank you for tuning into another great episode of #ThatBusinessShow with your Host, Jamie Meloni! Remember, you can start your day right by tuning into #ThatBusinessShow every weekday at 8am on #1250WHNZ and on http://www.tampabayradio.com! If you missed today’s show or want to take a look at who has been on the show in the past, head to http://www.tampabayradio.com to listen to any show that’s been on the #MorningAir! Today on another #MorningWithMeloni we welcomed Tim Jarrett, General Manager of the Centre Club here in Tampa! We also welcomed Jason Woody, President and CEO of The Lion’s Eye Institute For Transplant and Research! We had great interviews and discussions on the #MorningAir, and if you missed out, you know where to go! 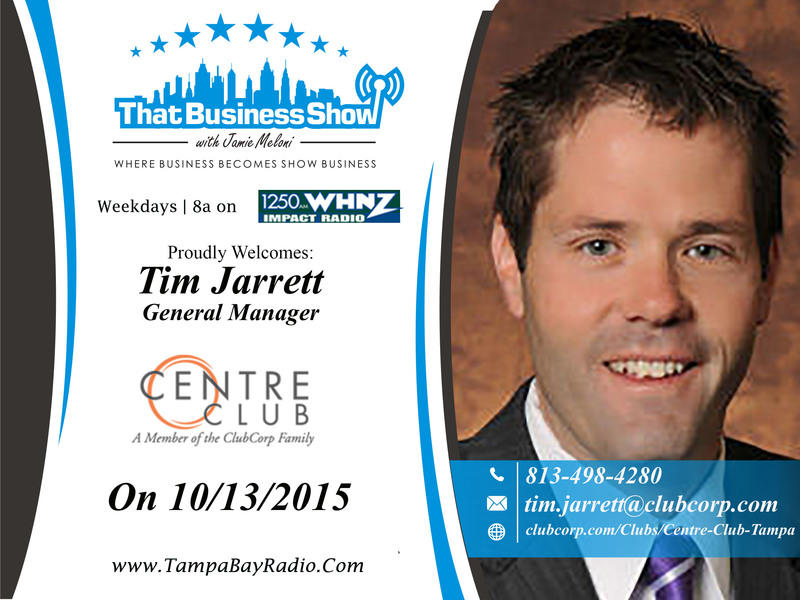 Coming up first on #ThatBusinessShow with Jamie Meloni was Tim Jarrett, General Manager of the Centre Club in Tampa. Providing a space high in the sky for businessmen and women to connect, work, and even have dinner, the Centre Club is a prestigious place to grow your company with the connections that are provided by the other members. The Centre Club is a nationwide club, so if you were personally invited to the Tampa Bay location, you could have access to any Centre Club, from Seattle to Chicago! They are so confident in their ability to grow your business and provide you and your company with impeccable service that they are spending $1.8 Million to even better serve you and expand! They are holding a grand opening party to celebrate this expansion, an event they are naming “Bar Wars”! They will have drinks from many bars in the city competing to be the best craft cocktail! Find out more about the “Bar Wars” event at http://www.centretampa.com! 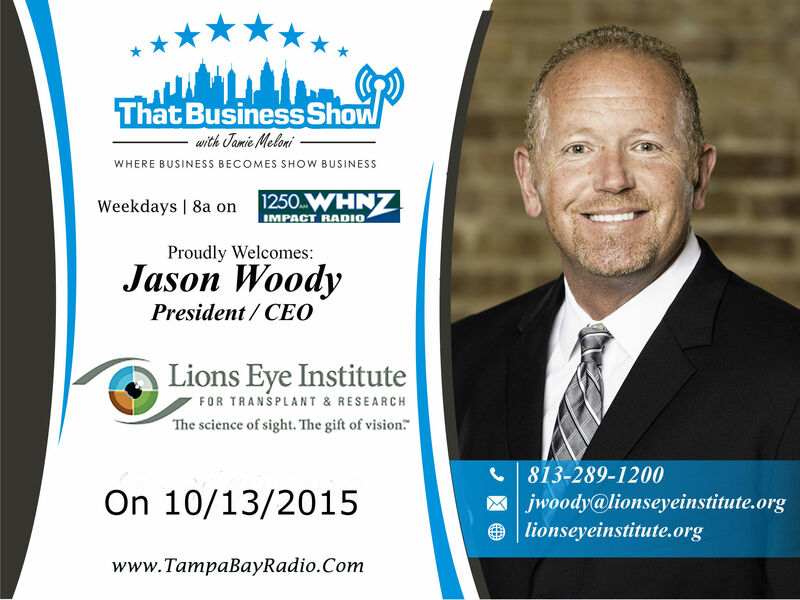 On the last segment on #ThatBusinessShow was Jason Woody, President and CEO of Lions Eye Institute. Since 1973 the Lions Eye Institute for Transplant & Research has brought the “Gift of Sight” to over 52,000 men, women and children around the world and provided over 30,000 eyes for invaluable research. The Lions Eye Institute has been ranked the single largest eye bank in the world for the past decade. Jason gave us a bit of the history of Lions Eye, beginning in 1917 with the inspiration of Hellen Keller. Now the company is global, and has the largest facilities for ocular studies. They are hosting the Eye Ball Gala soon, a formal event raising money for research! You can find out more about Lions Eye Institute and the Eye Ball Gala at http://www.lionseyeinstitute.org.